Do you look forward to the annual cheese-rolling? Or have you taken part in a dragonboat race? Perhaps you have danced in the street as part of a big street carnival. 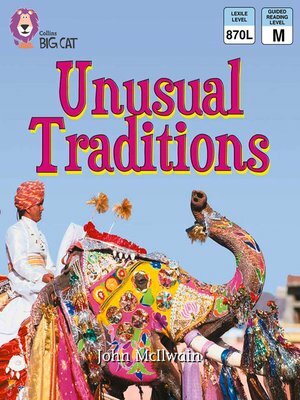 All around the world people take part in traditions that might seem unusual, but are great fun for everyone who joins in! Find out about all these and more in this information book. â?¢Purple/ Band 8 books offer developing readers literary language, with some challenging vocabulary. â?¢ Text type - Non-chronological report. â?¢ An index is shown on page 21, and a labelled map of the world on pages 22 and 23 showing where the traditions featured in the book originate, an ideal cue for further discussion. â?¢ Curriculum links - Citizenship: Developing good relationships and respecting the differences between people; Geography: Where in the world is Barnaby bear?, Passport to the world.